A balanced flue gas fire is a glass fronted gas appliance which is classed as room sealed. The fire is completely sealed from the room into which it is installed and to operate the gas fire needs a special coaxial pipe (one pipe inside another). This pipe needs to be routed to an outside wall or the roof. 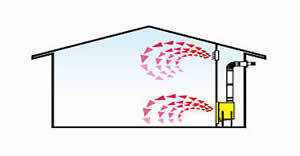 Air is drawn in from the outside for combustion purposes, this air is warmed by the exhaust pipe, increasing the efficiency of the fire whilst the inner pipe vents the combustion gases safely away to the outside of the property. The image below shows the possible flue routes that can be used for balanced flue gas fires. All of the fires are designed for a 100/150 flue pipe which is the cheapest available however the appliances can be upgraded using a flue adaptor to 130/200 if the chart below allows. The chart needs to be used in conjunction with the model you have chosen from our range. All fires are controlled by a sequential remote control with optional thermostat. Fires are supplied with either logs or pebbles and can be purchased for use on natural gas or LPG / Calor gas. The flue can be routed with multiple bends however this must still comply with the installation instructions. Why buy from us? Our fires are cheaper than comparable models from other UK suppliers. Our fires include parts in the price which other charge for as optional extras. We supply the flue pipes from the factory with the appliance keeping overall costs down. We sell them for the same price to everyone. Need advice? Call our trained Sales Staff on 01325-301020 who will guide you through the range and the installation requirements. All our Balanced Flue Gas Fires can be installed in to an existing chimney using our special Flue Renovation Kit, saving cost on the pipes and overall install, ask for details. NOTE: The Venezia 3-Sided and Peninsular models can only be used with the 200mm diameter pipes. NOTE: All of the fires can be used with either 150mm or 200mm flue pipes. The choice depends on the flue route required, excluding the Venezia 3-Sided and Peninsular models which can only be used with 200mm diameter pipes. SHOWN RIGHT: This is a typical Balanced Flue Gas Fire Installation. The fire is supplied as a cartridge on legs. The flue is routed and the fireplace is built around. The fire radiates heat and to maximise the efficiency the cavity should be built to allow the air to circulate back into the room. 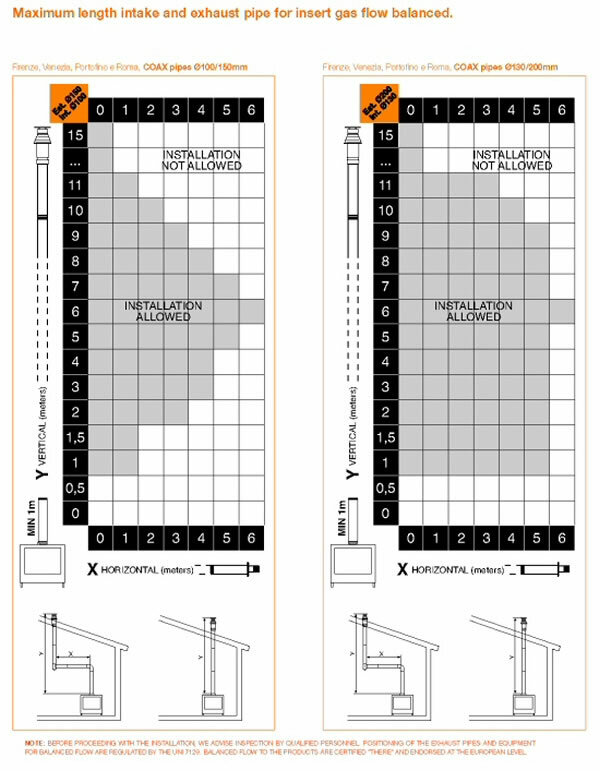 We can supply a full installation guidance sheet, individual model specifications and also the install booklets. these can be emailed upon request, please call 01325-301020 or e-mail. The term balanced flue comes from the flue pipe that is used. This is a very special type of flue system that has an outer pipe which carries fresh air and an inner pipe which acts as an exhaust for the fireplace. Balanced Flue Gas Fires are classed as room sealed appliances as the air for the burner is supplied by the flue pipe. This means that all balanced flue gas fires must have a glass front and cannot be modified in anyway (unlike an open flamed gas fire). Balanced flue gas fires typically have energy efficiency rating of 75% or higher. When comparing energy efficiency ratings between appliances ensure you are looking at “like for like” figures. Some companies quote Gross Efficiency while others quote the Net efficiency. The CE standard that the fire was tested to may also have changed. Do not use energy efficiency as your main reason for choosing between appliances; relatively speaking they are all the same. Your choice should be made based on the Kw rating of the appliance. The larger the size of the gas fire appliance the higher the Kw rating (or power) will be. This is because the flame cannot be stretched out so more power is needed to maintain a visually appealing fire. A 10Kw gas fire with 75% efficiency will give 7.5Kw into the room. This is similar to adding 3 new radiators to the room. Some companies sell fires that are bigger than our largest model the 1300mm and in some instances where customers have bought large fires they have ended up not actually using them.